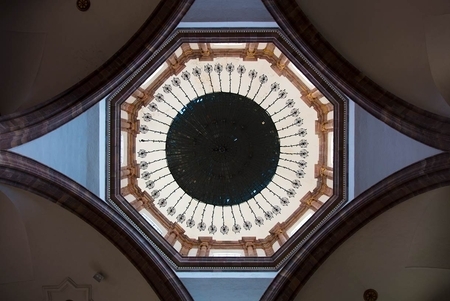 During our stay in San Miguel de Allende, Mexico, I discovered upon visiting their beautiful churches, that each had a chandelier hanging from the center of the cúpula over the transept in front of the altar. When I positioned myself directly under the light fixture, I was able to perceive the perfect kaleidoscopic patterning created by the chandeliers and the surfaces in the domes. The word “mandala” immediately came to mind. These cúpulas/mandalas can be appreciated on many levels. In themselves, they are elegant and artful symmetrical creations. They can be seen as a representation of the grandeur, order and complexity of the celestial universe. To some they might be evocative of the light emanating from the supreme. For others, they might create a sacred space into which one can send one’s prayers, concerns, and hopes. Also, for many, the inviting geometry can readily serve as a path to contemplative thought. There are currently 8 in this series. I hope you enjoy them.